While diesel engines might be fading in the car and SUV markets in North America, it’s still an extremely popular way of powering pickup trucks. Thanks to amazing low-end torque, great range, solid fuel economy, and legendary durability, shoppers love to put a diesel in their work or play vehicle. To help you find a good option, we’ve put together this handy summary of the best diesel trucks on the market today. You’ll notice that American brands dominate, but some import automakers are starting to really zero in on the fact people on this continent need or at least really like driving a truck with a massive diesel engine. Plenty of truck shoppers choose what the Blue Oval offers, and for good reasons. While not everyone is a fan of the aluminum body panels and EcoBoost engines, Ford at least has been quite creative, if not innovative, with its truck lineup lately. If you’re looking for a solid diesel offering from Ford, the Super Duty range is your best bet. If you want to go diesel, the Ford Super Duty uses a 6.7-liter Power Stroke V-8 paired up with a six-speed automatic transmission. Peak output is pretty impressive at 925 lb.-ft. of torque and 440 horsepower. That allows owners to throw up to 7,630 pounds in the bed. So you could theoretically haul another vehicle back there without problems. Conventional towing capacity is 21,000 pounds. 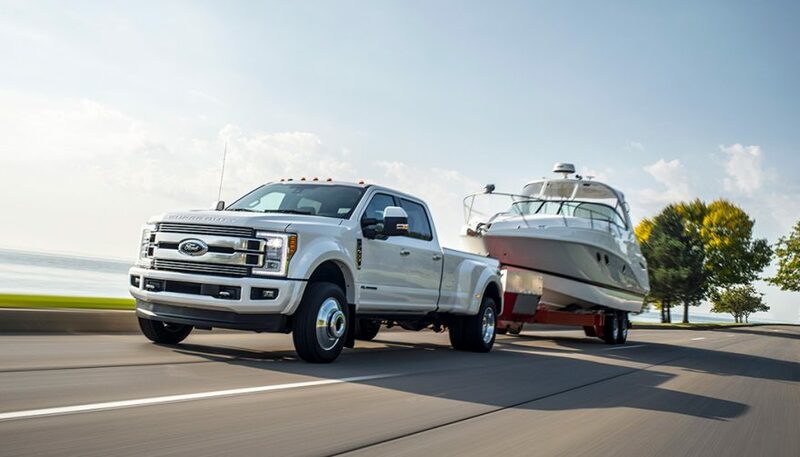 While a properly equipped Super Duty can handle 27,500 pounds with a fifth-wheel setup or 32,500 pounds with a gooseneck. Out of the Super Duty trucks, the Limited line is the supreme. Putting it on this list of the best diesel trucks. Of course, you’re going to shell out a premium for a Limited, considering base MSRP is about $80,000. For that kind of cash, you benefit from two-tone Camelback leather seating, plus leather on the armrests, steering wheel, and dash. A Miko suede headliner adds a sumptuous touch, along with dark ash wood trim pieces. To emphasize this isn’t just a regular Super Duty Limited, Ford includes satin trim pieces on the exterior. Diesel engines are good for more than just towing and hauling massive amounts. 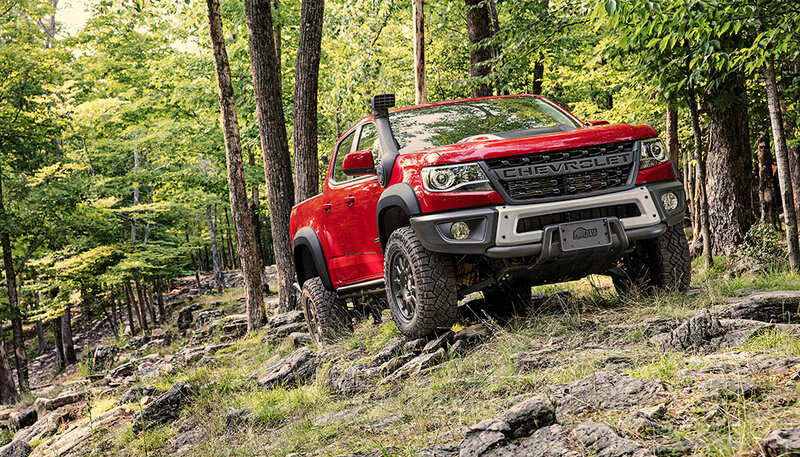 The Colorado ZR2 Bison has been built for getting through some tough trail conditions. Making for a great method to get away from it all. Just like with the regular version of the ZR2, you can add the 2.8-liter Duramax turbodiesel engine to the Bison. It comes with 186 horsepower and a mighty 369 lb.-ft. of torque. That’s plenty of grunt force to get through deep mud, crawl over boulders, ford streams, and do pretty much anything else you could want with this truck. A six-speed automatic transmission comes mated to the engine. 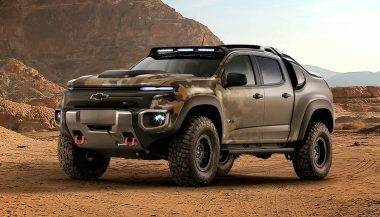 Making this one of the best diesel trucks, Chevrolet teamed up with American Expedition Vehicles (AEV) to ensure the ZR2 Bison is really capable of handling rugged trail conditions. Included in the impressive list of equipment is an AutoTrac transfer case. With low range plus front and rear locking electronic differentials. It also has cast-iron control arms and Multimatic DSSV dampers. Off the factory line, the truck features 31-inch Goodyear Wrangler Duratrac off-road tires that required Chevrolet to add larger fender flares. Stamped steel bumpers designed by AEV accommodate a winch and fog lights plus feature multiple recovery points. Five hot stamped boron steel skid plates protect everything vital and otherwise vulnerable in the undercarriage. You can even add the optional snorkel, which is a great feature for water crossings. Or if you’re going to be driving in especially dusty environments. Basically, if this truck can’t get you to where you’re going, perhaps you shouldn’t be heading there. Yes, it’s hard to believe the same automaker that brought us the monstrosity known as the Juke crossover also makes a big, bad diesel-powered pickup truck. The Titan XD is pretty impressive all around. Especially considering you can get one with a 5.0-liter Cummins turbodiesel V-8 under the hood. 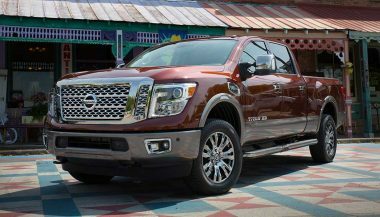 Nissan offers three body styles for the Titan XD: Single Cab, King Cab, and Crew Cab. The first one comes with an 8-foot bed, while the other two feature a 6.5-foot bed. 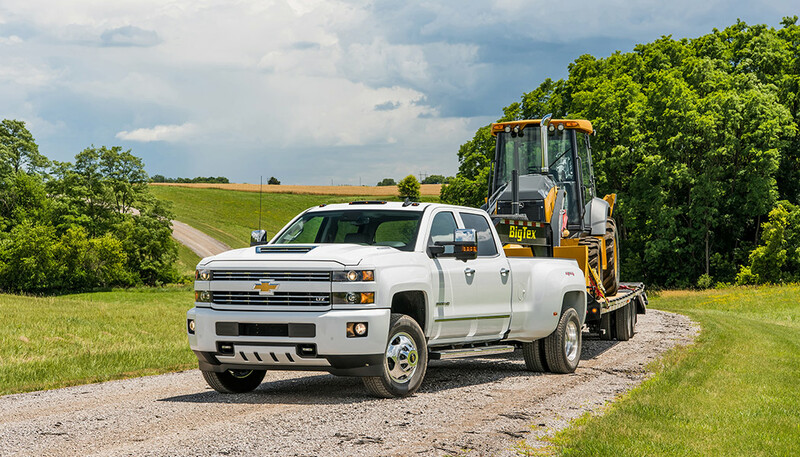 Maximum payload capacity is 2,590 pounds and towing capacity tops out at 12,640 pounds. Those aren’t colossal numbers, but then the Titan XD isn’t a colossal vehicle. Still, it’s good enough to bring along a good-sized boat, camper, or any other forms of fun. 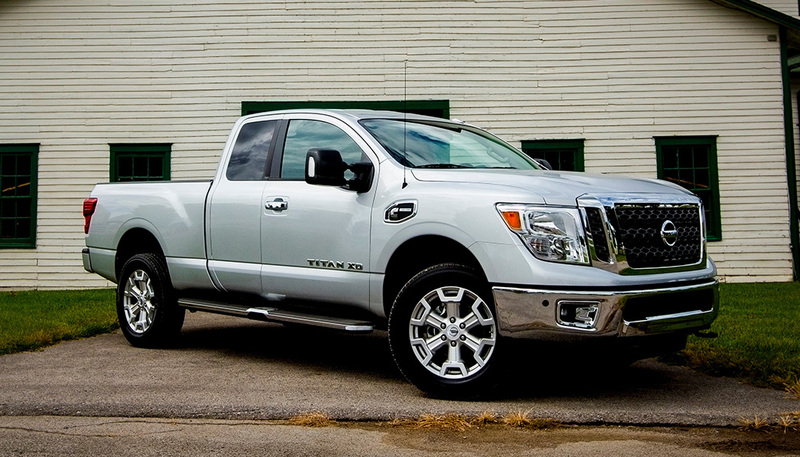 Some people call the Nissan Titan XD a “tweener” truck since it’s not a 3/4 or 1-ton pickup. If you want plenty of capability but really hate trying to park and maneuver something huge day after day, the Titan XD is a great option to consider. What’s more, you can really load it up with luxurious features if that’s what you want, which could make this one of your best diesel trucks. Like supple leather upholstery, ventilated seats, and other premium materials. Available Intelligent Around View Monitor warns if moving objects are near the truck. That’s a big plus for all kinds of situations like backing out of your driveway or a parking stall at the grocery store. Or even maneuvering into the perfect camping spot for the weekend. Mopar fans get some representation on this list with a real monster – the Ram 3500. Even as heavy-duty pickups go, this one is pretty impressive on many levels. Since this list is all about diesel power, we’ll go over that aspect first. The 6.7-liter Cummins turbo diesel inline six-cylinder engine paired with the AISIN six-speed automatic transmission makes for an almost unstoppable duo. Helping make this one of the best diesel trucks. Consider that max torque is an earth-shattering 930 lb.-ft., which combines with 385 horsepower for excellent performance. You can throw up to 6,720 pounds in the bed, while the truck can tow a max 31,210 pounds. That should cover just about anything you could ever need to transport yourself. Even if you were to buy a really big boat or camper. Believe it or not, Ram will allow you to row through the gears too. 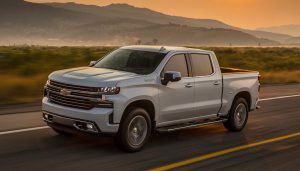 You can get a six-speed manual transmission which has been upgraded to handle the kind of torturous work you’ll likely put the truck through. Included is a wear-compensating clutch that keeps the clutch pedal feeling the same as it wears down. So performance doesn’t suffer. The good times don’t stop there. You can get the Ram 3500 with all kinds of extra goodies. Providing slick storage that locks at the same time as the doors, the RamBox Cargo Management System makes use of the side rails of the bed. When you open the lid, LED lighting illuminates the area, which is helpful at night. Drain holes mean you can throw ice with drinks, wet clothing, muddy equipment, or whatever else inside the compartments. Helping make this one of the best diesel trucks, add an upfitter switch interface to make adding extra features like tow lights or a snow plow to the electrical system easy. Because this truck is really made to haul and tow big loads, Ram includes an Electronic Range Select feature. As the driver, you get to automatically or manually select the best gear for downshifting and engine braking. That’s especially helpful if you’re towing or hauling in hilly areas. Did you think this list wouldn’t include the big guns from GM? While the Chevy Colorado ZR2 Bison is a great midsize excursion truck, if you want raw power to tow and haul with the best, the Silverado/Sierra 3500HD is where it’s at. These trucks are essentially the same when it comes to performance. Which is at the heart of anyone’s desire to get one of the best diesel trucks. But, you need to keep in mind that the differences don’t stop just with cosmetics. For 2018 GM gave these twins a new Duramax L5P 6.6-liter turbodiesel V-8 engine. While not the most powerful option on the market, the peak 445 horsepower and 910 lb.-ft. of torque is still impressive. Of course, the most capable setup is with dual rear wheels. That allows for a max payload rating of 5,518 pounds, conventional towing up to 20,000 pounds, and a fifth-wheel/gooseneck max of 23,300 pounds. For most people, that’s going to be well more than enough. If it’s not enough, then it might be time to look above the HD pickup market. To a real medium-duty truck. Like something from International or Freightliner. Of course, a whole range of new features come with the new Silverado and Sierra pickups. One is a fill alert for the tire pressure monitoring system, taking the guesswork out of inflating the tires. All models with a cargo box also have a rearview camera on the tailgate. Which is actually quite useful when trying to line up the truck with a trailer hitch. Some people are fans of the new grille and headlights design, but others absolutely hate them. Especially the fact that the front fascia changes so much from one trim to the next. Looks aside, this is a diesel truck that will get stuff done, and that’s the real point. Perhaps the biggest reason to choose the GMC is the ability to get the Sierra 3500HD Denali. Yes, it comes adorned with all kinds of exterior chrome treatments, including a surround for the available hood scoop. The interior is just crammed with luxuries. Like a heated steering wheel, leather upholstery with premium stitching, and heated/ventilated front seats. To say this is one of the most luxurious and best diesel trucks on the market wouldn’t be an overstatement. 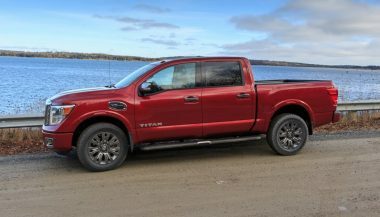 A new addition to the F-150 lineup, and one people have been clamoring to have added for years now, the diesel engine option is proving to be quite popular. That’s really not a huge surprise, considering the F-150 has been the best-selling vehicle in the United States for over three decades. 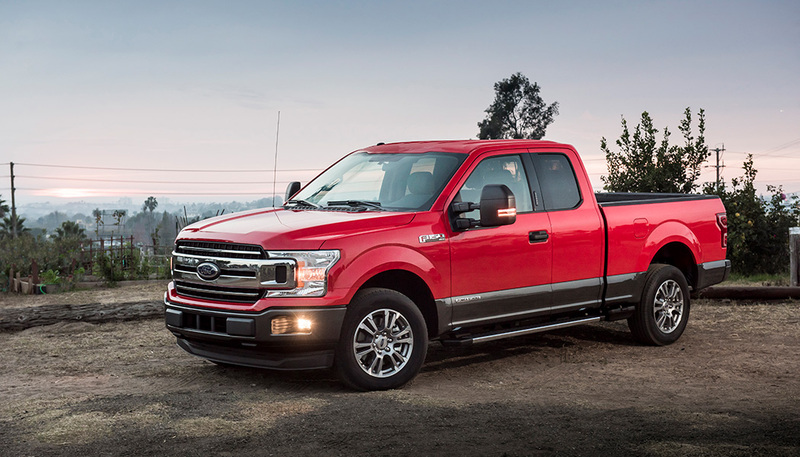 Some people thought Ford would never make this move because adding a diesel engine to the F-150 would’ve stolen sales from the Super Duty lineup. With competitors offering diesel power, Ford’s hand was forced, and this is the result. To help make this one of the best diesel trucks, Ford created an all-new 3.0-liter Power Stroke turbodiesel V-6 for the F-150. The automaker claims the new engine uses many of the same designs and principles from the bigger Power Stroke engines. So it should be quite durable in addition to being capable. What you get with this option is 250 horsepower and 440 lb.-ft. of torque, which is pretty good for something that isn’t a heavy duty model. Mated to the engine is an advanced 10-speed automatic transmission, which does an excellent job of keeping the engine working in its optimal rpm range. Naturally, many will buy the F-150 Diesel for its capabilities. The truck will tow a maximum 11,400 pounds if properly set up, which is pretty good for something that isn’t a heavy duty model. But the other really compelling thing about an F-150 with a Power Stroke turbodiesel is fuel economy, which the EPA estimates to be 22 mpg in the city and 30 mpg on the highway. Those numbers are quite impressive. If you can get a 2018 model, the Ram 1500 is offered with the much-lauded 3.0-liter EcoDiesel engine. One of the big reasons why people have loved this option is the 27 mpg highway fuel economy rating, which is with four-wheel drive added. Helping make this one of the best diesel trucks. At the same time, you still enjoy solid performance. Peak output is 240 horsepower and a monumental 420 lb.-ft. of torque. 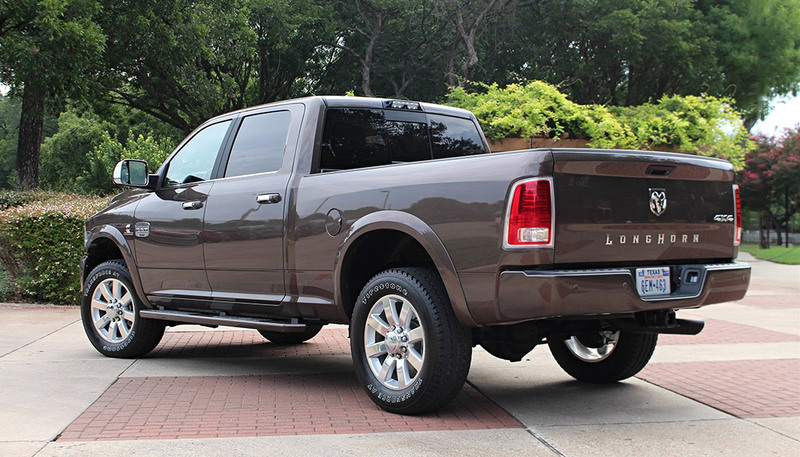 Ram pairs it with the TorqueFlite 8-speed automatic transmission, which was created for towing and hauling. In the lower gears it helps the truck accelerate rather quickly, while the upper gears are more for efficient operation. 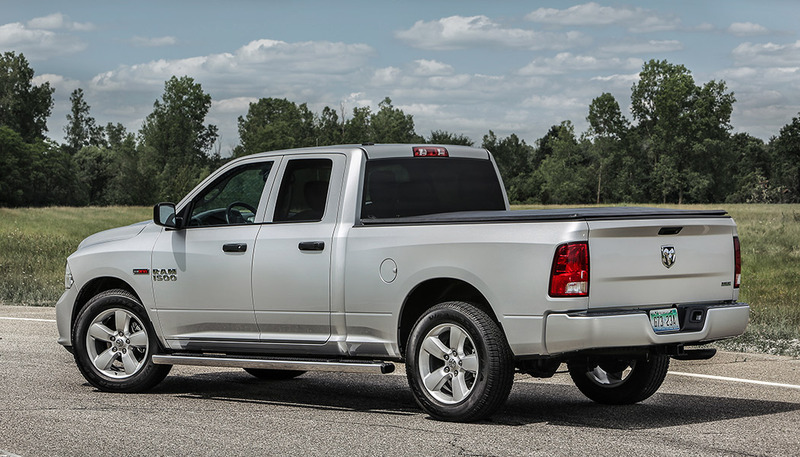 Like its big brother, you can get the Ram 1500 with the RamBox Cargo Management System. It’s a seriously helpful way to stash tools, tow chains, cargo straps, or whatever else you need. The interior can also feature all kinds of storage areas. Like a compartment in the floor of the rear seating area. Or a second glovebox in the dash. You can also get all kinds of premium finishes. Like real wood trim and leather seats. You can add all kinds of cool and useful technologies. Like the Uconnect 4C NAV system with SiriusXM Guardian, a front and rear park assist system, and a 7-inch color screen in the middle of the gauge cluster. Though if it’s ultimate payload you’re looking for, then the Ram EcoDiesel’s lower ratings might come up short. 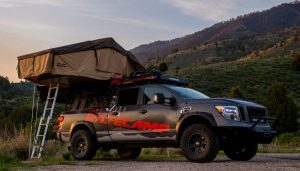 The Nissan Titan XD is an amazing vehicle, but it's so nice, you might not want to take it out in the woods on your next hunting trip.